COLOUR, DEVOTION, REVELRY AND valour take on a new meaning every year with the onset of Chet (Chaitra), when, in Punjab, all roads lead to the historic Anandpur Sahib. Holi and Hola announce the arrival of spring, and history bursts into life at the foothills of the Shivaliks. The birthplace of the Khalsa, the city of bliss, true to its name, rises, resplendent in its full glory, as the faithful pour in by trains, buses, motorcycles, trucks and on foot. There is the robust display of weapons, martial arts skills and simulated war activities (gatka), breath-taking horse racing, archery and sword play, set in the ambience of nonstop langar (community kitchen) services, nagar kirtans, processions, games and teeming bazaars and the valiant Nihangs in their traditional blue attires and high turbans adorned with weapons and the insignia of Sikhism. And, the festival of Hola Mohalla is off to another grand start, attracting more than five million people from all over the world every year. Hola Mohalla is today celebrated with equal gusto and reverence, in gurdwaras in all the countries that house the 30 million Sikhs of the world. According to Bhai Kahan Singh, the compiler of Mahan Kosh, (the first encyclopaedia of Sikh religious terms), Hola Mohalla stands for the charge of an army. But, it is that and much more. 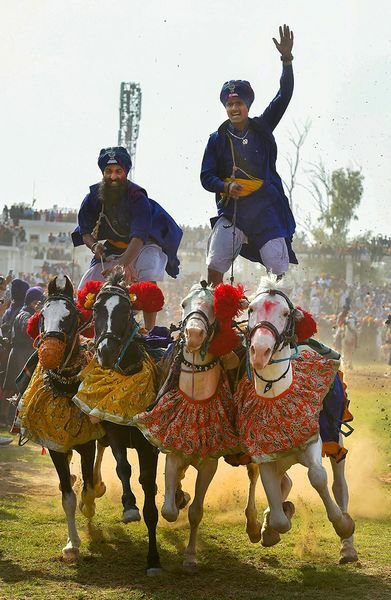 Spectacle is the very essence of Hola Mohalla, highlighting the military prowess and bravery of the soldier-saints, and at the same time reminding the community of the need to keep itself battle ready. More than 300 years later, today it remains central to Sikh culture, in the form of a weeklong festival that begins with a number of durbars, with akhand path (continuous recitation), kirtan and religious discourses happening simultaneously in the prominent gurdwaras of the region. The last day is marked by a long procession, led by the panj pyaras (the five faithful Khalsas), which begins from and culminates at Takht Sri Keshgarh Sahib, after passing through important gurdwaras like Qila Lohgarh Sahib and Mata Jitoji Gurdwara. The festival marks the links that a peace-loving community was forced to forge with militarisation that took place after the martyrdom of the fifth guru, Arjan Dev. Guru Hargobind, the next guru, and his son enunciated the need for piri-miri, temporal power and spiritual power, to protect the interests of the Sikhs who faced the brutal onslaught by the Mughals. The tenth guru, Gobind Singh, was witness, at the tender age of nine, to the martyrdom of his father, Guru Teg Bahadur, and later his four sons and his mother, Mata Gujri. With subsequent conflicts with Aurangzeb and the Rajput rajas, it was inevitable that the community fight for its survival. Khushwant Singh, in his introduction to Hymns of the Gurus, says, “He realised that if his followers were to be saved from extinction, they had to be not only taught the use of arms, but also convinced of the morality of the use of force, in the service of a larger good.” One of the most quoted precepts of Guru Gobind Singh is: When all other means have failed, it is righteous to wield the sword. Therefore, it was important that the sparrow be trained to hunt with the hawk and ‘sava lakh se ek ladaoon’—to give each man the courage to stand up to an entire army and not to be afraid when one sets out to do what is right. So, the establishment of the Khalsa in 1699, and the call to the faithful to congregate for the Hola Mohalla festival at Lohgarh fort in Anandpur Sahib, in 1702, were a clarion call for unity among the Sikhs, marking the complete transformation of the community into a militant one—giving it a recognisable identity, a mission to save the community from being decimated, and a high moral and spiritual purpose. As a spiritual soldier/warrior-scholar, poet, saint, Guru Gobind Singh invested all his personal, temporal and spiritual concerns into these two watershed developments in the history of Sikhism. An academician and a young scholar of Sikh studies, Ishmeet Kaur Choudhary of the Central University of Gujarat says, “Guru Sahib was positing [it] together for the Sikhs to realise the unique power human beings have: of sword and pen together.” For her, Hola Mohalla remains “a way of proclaiming the Sikh talent of martial art and the power of expression with words through poetry”. For a community and region that have been at the receiving end of invasions, and have been haunted by the Partition, the 1984 killings and have faced political turmoil before and after independence, this kind of preparedness, sewa, spirituality, spectacle and celebration of life, perhaps, offer hope and rekindle the sense of pride. At the same time, it is a constant reminder that a deep tragic consciousness is the fertile ground in which culture, poetry and life are revitalised. Kaur is an academician and a poet, associated currently with SPARROW (Sound & Picture ARchives for Research On Women), Mumbai, and Muse India, a literary e-journal, Hyderabad.